Hi, I am Chris! I have retired at the ripe age of 32. Hi guys, I am Chris. I retired at the age of 32. After I graduated from university with a Masters in Business Administration, I worked as a financial consultant in Europe. It wasn’t long until I decided that I wanted to quit the soul-sucking, pointless corporate rat race, strike out on my own, and live life on my own terms. Turns out, this was the best decision I have ever made! Almost seven years ago, from one day to the other, I packed up my stuff and flew to SE Asia. I had no travel plans, no bookings, no itinerary, no connections, no rescue plan, nothing. I just packed my suitcase with what I thought I would need the most, and just left. First destination: Bangkok. I traveled through Thailand for one month, and visited my sponsor child in Cambodia, which was an incredibly enriching experience. After two months in SE Asia, I decided to move on and hoped on a plane to Australia. I worked in Perth for two years for an events management company. After two years in Australia, however, I did the math: I was an aggressive saver throughout my life and invested my money since I was 15 years old. The money I socked away throughout my life and the income my investments produced were sufficient enough to “retire”. 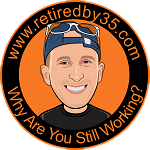 For the first couple of years in my early thirties, however, I wasn’t “fully retired”. I occasionally took on some freelance gigs as a consultant, but soon enough, at age 32, I called it quits. My investments (mostly dividend-paying stocks, rental and online income) were more than enough to fund my recurring living expenses. This was when I realized for the first time that I was indeed financially independent. I didn’t have to work anymore. And if I didn’t do something too stupid, I would probably never have to step into a corporate office ever again. What an incredibly liberating feeling! Today, I am an investor, online entrepreneur, author, coach and passionate traveler. I have traveled extensively throughout SE Asia (Thailand, Cambodia, Laos, Malaysia, Philippines) and the Middle East (Israel, Palestine, Jordan, Egypt). I like traveling, meeting new people, immersing myself in new cultures, and learning new languages. When I meet new people, they rarely believe that it is possible for people in their 30s to retire. Yet, it’s exactly what I have done, and I don’t have a wealthy background at all. The last time I entered a corporate office was almost nine years ago, and I haven’t missed a single day! It’s not that I don’t like to work, don’t get me wrong. The point for me was always that the work I did wasn’t very fulfilling or had a deeper purpose. Plus, everyone in the office used to be super busy all the time, drowning in work, always stressed and burned out, and always complaining. What’s the point being there, really? While it may not be entirely intuitive for most people, the truth is that it’s quite easy to retire in your early 30s, if you adopt the right savings and investing principles. In my experience, most people – unfortunately – don’t have a very high financial IQ as they tend to know little about the principles of investing. Most importantly, most people just spend waaay too much money on crap that holds them back. Just so you know, after I graduated university, I immediately socked away 50 percent of my salary and put it into an investment account earning income, and I just learned to live with the rest. Today, it is my mission in life to teach young people how they, too, can retire at a young age through a sensible mix of saving money, investing money, budgeting, managing their debt, working smart, and, just as importantly, reinvesting money. Living abroad for nearly a decade now, it has become my passion to teach and educate people from all walks of life about how to attain financial independence and how to live life on your own terms!